DETECTIVE COMICS #997 is a very straightforward action story. It's in the vein of classic stories, with Batman caught in a deathtrap from which he must escape. Of course, if you're gonna be stuck in a trap like this, the original Mister Miracle is a good person to have in your corner. A great installment in Tomasi's ongoing run. 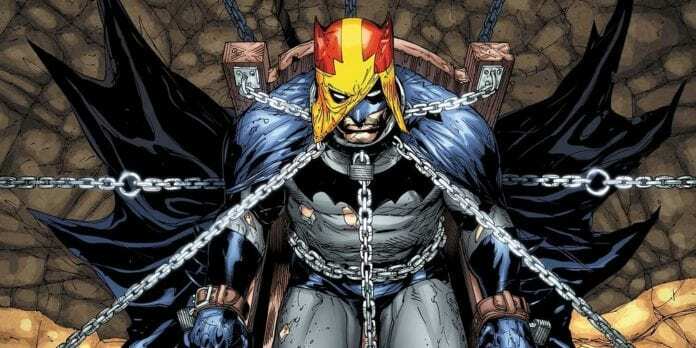 Batman’s forced to run the gauntlet of escape artist tropes in Detective Comics #997. The monster hunting down Bruce Wayne’s mentors over the last several issues targets Thaddeus Brown, the master escape artist who taught Bruce and Scott Free everything they know. The pair are trapped in a tank of hungry sharks without the benefit of Batman’s utility belt. Now, they must find a way to escape with their lives and uncover the monster’s origins before they become lunch. The writing in Detective Comics #997 is compelling and super-fun. The “escape from a shark tank” concept hearkens back to material you might see in a Golden Age Batman story. The modern framing and storytelling make it work, though, ultimately feeling fresh and exciting rather than goofy and anachronistic. Beyond the fun of the individual story, development of Tomasi’s story arc commands central attention here. The monster taunts Bruce, claiming to know everything about him. The implication, of course, being it knows how to cause the most damage by striking those close to him. That was implicit in the last few issues, too. But, without giving away anything, we can say the anxiety takes on a much more literal form here. Each issue of Tomasi’s run builds on the tension and momentum of the last in the lead up to #1,000. This one, however, stands out as a strong point from a storytelling perspective. The reader can appreciate that Detective Comics #997 provides a balance of engaging storytelling, fun action, and development of the larger narrative. The events of the book take place over the course of, perhaps, five minutes, with all but the last two pages a part of one continuous action sequence. As a result, artist Doug Mahnke is unable to show-off as much of the eye-catching visuals featured in previous issues. Mahnke manages to keep things interesting, though, with lots of tight, dynamic cuts between panels. The perspective shifts radically from one panel to the next but is always closely-focused on the figure in frame. The artwork in Detective Comics #997 doesn’t get as much time to shine, but it is super-effective at keeping the reader engaged and tuned-in to the story, which means it does its job. Detective Comics #997 is a fun, action-packed chapter in the ongoing story. It keeps readers engaged and ratchets up the tension nicely. If you’re not already following Tomasi’s run, get caught up now.